Coming Soon: A New Constitution! *Human food may not healthy for wild animals, and they do not need food from humans to survive. *Feeding leads to public health concerns. Too many animals in one place increases the chance of disease transmission to people and among other wildlife. *Animals accustomed to people often lose their fear of people and can become aggressive. Those that become too aggressive may have to be destroyed to protect people and property. *Animals fed along roads tend to stay near roads, increasing the chance of vehicle-animal accidents. Now while all of those reasons may sound reasonable, I was not made aware until yesterday while I was watching, of all things, Chopped, The Food Network’s competition cooking show…that apparently cities all across the USA have recently discovered a way to make American wildlife, i.e. the homeless, go away. Don’t feed them! And many of the ordinances approved by city councils nationwide cite similar reasons as those mentioned above for making the feeding of homeless persons illegal. Did you know that since 2006 and in efforts to make the homeless in America, for lack of better words, go away, U. S. cities have gradually been banning and outlawing activities such as camping, begging, sleeping in cars, sitting or standing on the sidewalk for more than 5 minutes and now feeding them! In over 70 cities nationwide it is now illegal to feed the homeless. In fact recently in Ft. Lauderdale, Florida, a 90-year-old WWII veteran was actually arrested for feeding the homeless. And It’s punishable by 60 days in jail or a $500 fine. And in Houston police even ticketed a homeless man for trying to feed himself by fishing a donut from a trash bin in a public park. Wow! And I thought that cruel insensitivity and a lack of basic decency only existed in our country’s political campaigns. But not so. It’s becoming the law of the land too! I know I’m just a bleeding heart liberal who should have been paying closer attention…but has it really come to this? Have all of us good Christian American Capitalists really tried everything we could think of in our efforts to ease and erase the plight of our over half a million homeless citizens? (many of whom are also veterans of our wars) Have we simply run out of ideas? I propose this song as the United States new National Anthem! The Star Spangled Banner is so old and out dated and no one can remember all of the words anyway… and it’s too long. And this song that I propose is modern and with a beat plus it captures America’s conflicted and new mood… and it has so few words that everyone can remember them and sing along. And you probably used to say things like “Live and let live.” Especially to your parents…You know you did. But the world has changed and now we all say. “Live and let die.”… You know we do. And it’s even got loud music, crescendos, bombs bursting and fireworks! So what do you say America? Let’s change our National Anthem. Isn’t it time we did? Really, What does it matter ? It’s just a song we sing at ball games. and give the other fella hell! The people have spoken and they have elected a game show host, an entertainer, a showman to be our next President of the United States. And with him come the best and the brightest minds to help him set our country right…just as he promised. And so we have Amarosa, TV personality and “D list” star to serve as our Trump surrogate for his Enemies List! Because what President of American Democracy and Freedom doesn’t have an enemies list? #Making America Great Again! Mr. McCain, was shot down during the Vietnam War and held prisoner for more than five years in Hanoi, refusing early release even after being repeatedly beaten. In fact over 59 million Americans voted for Donald Trump and did not seem in the least bit bothered nor swayed by his comments about Veteran’s and war heroes. 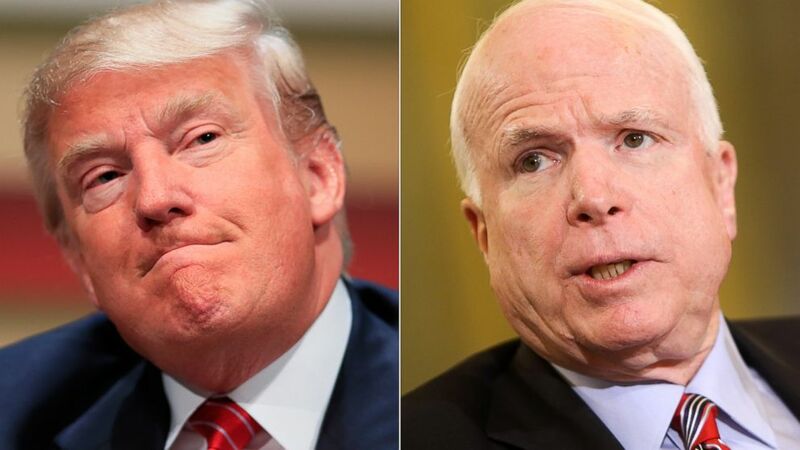 And although Mr. McCain did not agree with Mr. Trump’s comments he still decided to support his candidacy for President. So if our new President picks and chooses who is an heroic veteran and who is not, then tomorrow on Veteran’s day, should I only cheer for the Veteran’s who weren’t also POWs? I just want to be like our new President. If our new President can earn billions of dollars and not pay income taxes then why will I still have to pay income tax on 85% of my Social Security income? 53% of America’s voters in this year’s presidential election were women and this was their chance to finally crack the greatest glass ceiling of them all and elect the first woman POTUS in the history of the United States. And they could have done it without any men votes at all! But instead only 54% of the 53% voted for Hillary while an astonishing 53% of all white women voters voted for Donald. I say astonishingly only because you would never see this happen among men. If we know that we control the outcome of something we definitely win that something. And according to the AP, six in 10 women were bothered by how Trump treated women, compared to about four in 10 men but again, that didn’t make any difference at all. So ladies? Good luck with that.